The sweet Basset Hound is instantly recognizable with his floppy ears, hangdog expression, and low-slung silhouette. The breed has an easy-going, patient disposition, though he's known to have a stubborn streak that can draw out training. Basset Hounds were bred to sniff out rabbits and other small animals who hide low to the ground in brush and thickets. Because of this powerful instinct to follow scents, they must be kept on a leash or enclosed in a yard at all times so they don't set off on the trail of a bunny. Bassets are wonderfully low-key companions, except when it comes to noise. This charming breed howls—loudly. 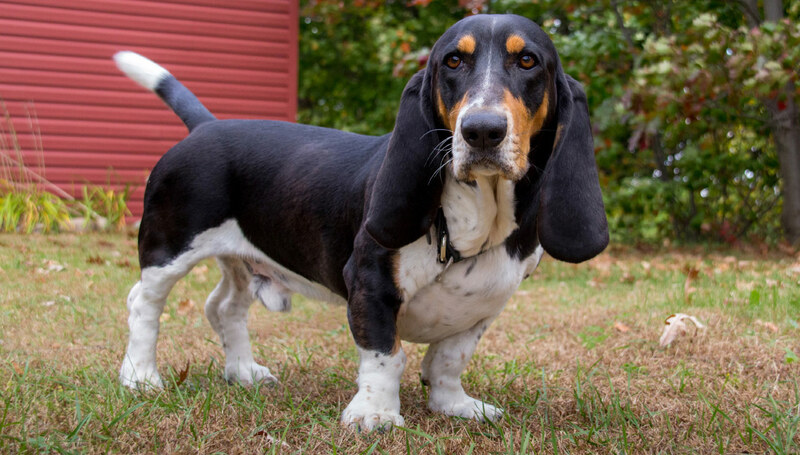 Coat - Basset Hounds have smooth, short coats that are dense enough to keep them comfortable hunting in the field in inclement or chilly weather. Their coat colors are a combination of two or three of the classic hound colors: black, red, white, tan, blue, brown, lemon and mahogany. Basset Hounds are stout dogs with short, big-boned legs, large paws, and a long body. They have big, long, floppy ears with a fine, velvety texture. Bassets have loose skin on their faces that wrinkles when their noses are down and contributes to their forlorn expression. Basset Hounds are descended from the St. Hubert hound, a hunting dog with a superior sense of smell. Bred by Abbot Hubert in 7th-century France, this dog would eventually split into two breeds with strong olfactory senses—the Bloodhound and the Basset Hound. The short legs of the Basset Hound made him adept at tracking rabbits through forest undergrowth and easy for hunters to keep up with on foot. The breed was first popular among French aristocrats, and later among common folk who couldn't keep horses for hunting. The breed became popular in the late 1800s when Sir Everett Millais began a breeding program in England, and Alexandra, the Princess of Wales, added Basset Hounds to the Royal Kennel. Soon after, the breed crossed the Atlantic to the United States where it went on to become a popular pet, hunting dog, and the inspiration for the famous "Droopy" cartoon character. Basset Hounds are laid-back, friendly dogs who love to take things at their own, often, slow pace. If allowed, this dog will take a meandering route on daily walks as he follows each new scent. He has a stubborn streak that makes housetraining and obedience training challenging, but not impossible with positive reinforcement and stick-to-itiveness. Are Basset Hounds Good with Kids? Yes. The good-natured and easy going Basset Hound ranks high among kid-friendly breeds. Children should be taught the Basset's long ears are not for tugging and extra care should be taken with their injury-prone backs. Are Basset Hounds Good with Other Pets? The Basset Hound's genial temperament extends to dogs, cats, and any other pets who are part of the family. Because Basset Hounds assume everyone is a friend, they aren't very protective of their own territory or their people. Are Basset Hounds Good Guard Dogs? Basset Hounds are not exceptionally alert at home. Some will howl to announce the arrival of guests, but they will just as soon nap through arrivals. Basset Hounds tend to have low energy levels and will lean towards sedentary if allowed. They can be independent-minded and stubborn. House- and obedience training require time and patience. A tendency to wander after scents if they find an opening. Their long backs need TLC, including limiting jumping and supporting their bottoms and backs during lifting. Will howl if left alone for too long. Indoor Basset Hounds always want to be near their families and don't respond well to being left outside alone. This breed sheds excessively, so daily grooming is important in order to minimize fur around your home. Bassets also drool excessively, so keep a towel handy and learn to love the slobber. Outdoor Basset Hounds enjoy the many scents the great outdoors have to offer. They love investigating the back yard and taking long, ambling walks with their people. Their dense, rugged coats protect them from bad weather for a short time, but they shouldn't be outside alone for long stretches. They become distressed if left alone for too long. Exercise Basset Hounds need two to three 20-minute walks and an easy-going play session each day to stay healthy and avoid weight gain. Endurance Basset Hounds have the stamina for long days spent hunting. However, they won't go at top speed and they'll take breaks as needed. Running Miles: Basset Hounds' short legs don't make them strong candidates for distance running. Hiking Miles: Basset Hounds can keep up with you on the trail for several miles, as long as the pace is easy enough for their short legs and there aren't tree trunks to climb over. Food Basset Hounds require 1½ to 2½ cups of quality dry dog food each day. Because of their risk of bloat, the food should be split between three meals. The exact amount will vary depending on the size, weight, and age of your dog. Talk with your veterinarian about an optimal diet plan. Alone Time A Basset's people are his pack and he really doesn't like being without them. Basset Hounds don't make great pets for people who are out of the house all day. When left alone too long, they are prone to separation anxiety and excessive howling. Basset Hounds shed heavily. Daily brushing can help manage fur around your house. Their ears require close attention because they are prone to infections. Inspect your dog's ears to make sure they don't smell and there is no redness, and wash his ears with a mild cleanser once a week. Give your Basset a bath every week or two to keep him smelling his best, and trim his nails every few weeks. You can minimize serious health concerns in a Basset Hound by purchasing from a reputable breeder who engages in responsible breeding practices, and through screening for common diseases and conditions. Basset Hounds tend to be stubborn and resist training. However, consistent and patient training pays off with a well-mannered, housetrained dog. Basset Hounds benefit from agility training that is designed for their unique bodies and keeps them physically fit. Just be sure not to overwork their short legs or strain their backs. Basset Hounds enjoy 'basseting' training, a sport that tests their scenting skills. No. Basset Hounds shed abundantly and, as a result, leave pet dander in your home. Dander is the cause of most pet-related allergies. Basset Hounds will be lazy if overfed and under-exercised. Accustom them to regular, moderate daily exercise to keep their slothful tendencies at bay. Basset Hounds can drool copiously because of the way their lips hang. Many owners keep a towel handy to wipe their dog's muzzle and minimize slippery, wet spots around the house. Why do Basset Hounds howl? Basset Hounds howl for the same reason as any dog: they want attention they aren't getting, they are responding to noises, they are trying to alert their owner to danger, or they are chatting with other dogs. No. Basset Hounds hounds are not good swimmers. They can paddle around for a minute or two, but their legs are so short they can tire out quickly and struggle to keep their torso above water. Never leave a Basset Hound alone near a pool or another body of water.